Comprised from ‘found’ & archived imagery collaged together using the repetition of carbon paper I am attempting to form new meaning for these images, referencing the visual syntax of a graphic novel & that of a childhood memory of drawing a pirates treasure island map on the grey cardboard back of a cereal pack. 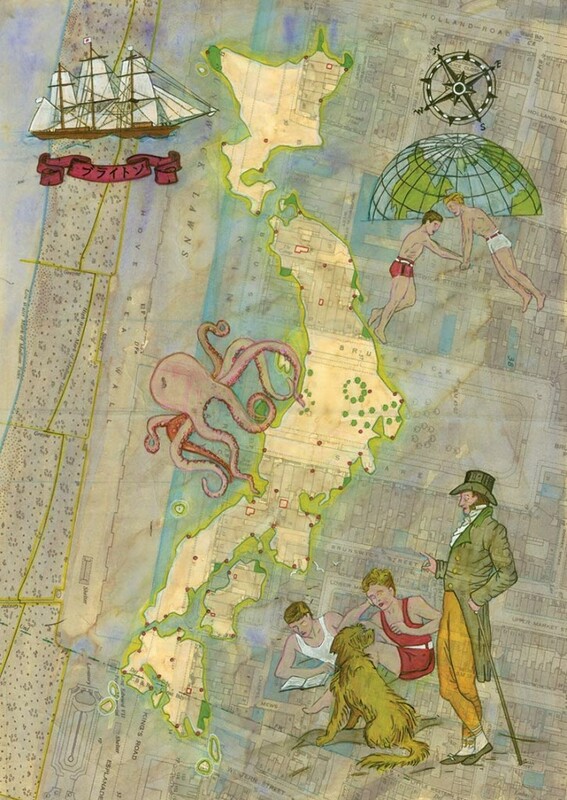 Where here a map of Japan is superimposed over a 19th century map of the Brunswick area in Hove, it has become part of a contrived fantasy or an iconographical enlargement embodying the circumstances of an unspecified encounter or a fictional biographical narrative. Jon Howe is a British mixed media artist living & exhibiting in Brighton, East Sussex, England. He graduated with a BA (Hons) in Fine Art from the University of Reading, U.K., in 1997 and a MFA in Sculpture from the School of Art, University of Washington, Seattle, U.S.A., in 2001.